The whole apartment is furnished and a very high standard, including with exclusive, dimmable lighting, modern solid wood furniture, brand fitted kitchen, electric blinds, underfloor heating and indoor ventilation. The living room is sunny and bright. The house well maintained, designed the staircase friendly and appealing. During construction, the use of high-quality and ecological building materials was emphasized, which has a very pleasant influence on the living environment. Regarding allergies, we have not laid carpets in the living areas as floor coverings. 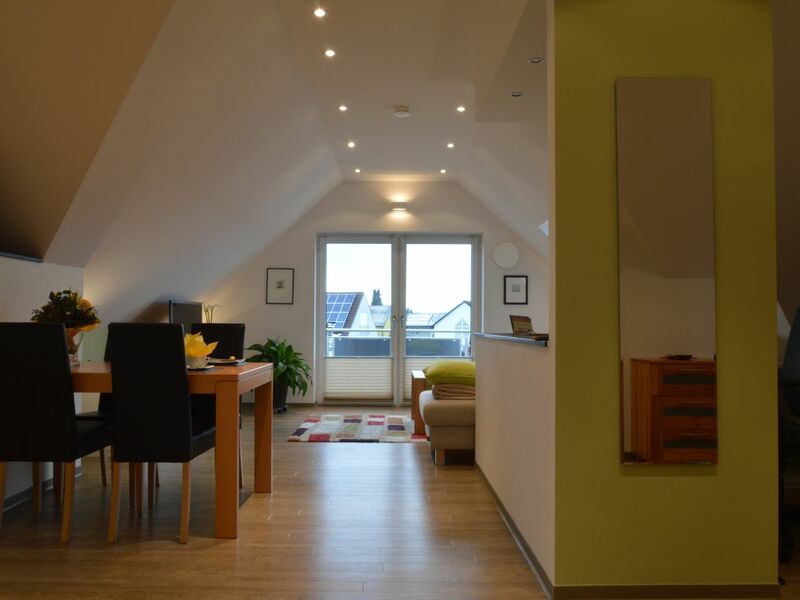 The whole apartment is tastefully decorated and a very high standard, including with exclusive, dimmable lighting, modern solid wood furniture, brand fitted kitchen, electric blinds, underfloor heating and indoor ventilation. The living room is sunny and bright. The house well maintained, designed the staircase friendly and appealing. When building was placed on the use of high quality building materials and environmental value, which affects the living environment very pleasant. The apartment is located in the holiday region "Franconian Tuscany" in Memmelsdorf in close proximity to Bamberg. The scenic surroundings with attractive excursion and hiking destinations offer the good infrastructure (city bus connections to Bamberg, abundant shopping, etc.) Nature & pure tranquility and central location at the same time. Bamberg and the surrounding area is well worth a visit! The house itself is in wonderful landscaped outskirts near the forest with popular cycling, jogging and walking routes in all directions. The town offers shopping Memmelsdorf bakeries, butchers and supermarkets, medical services, pharmacies, hairdresser, drugstore and gas station. Culinary offer is supplemented by cultivated gastronomy, regional cuisine and typical Franconian beer cellar. For art and culture lovers the region offers countless architectural monuments, concert series in Seehof Palace and the famous sculpture.